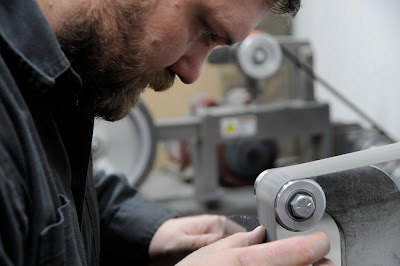 Perhaps you saw our post about a month ago, A Knife for Life, a piece on Brooklyn knife maker Joel Bukiewicz of CUT Brooklyn. Mr Bukiewicz took time out of his weekend to give us a tour of his metal shop (us ladies, have a bit of a soft spot for sparks and men who know how to work metal). We know that these knives photograph well, but let us tell you, these knives are absolutely breathtaking in person. The profiles are well shaped, not to mention the attention to detail, thickness of the blade, the taper of the blade, center of balance, and fit in the users hand are all considered. 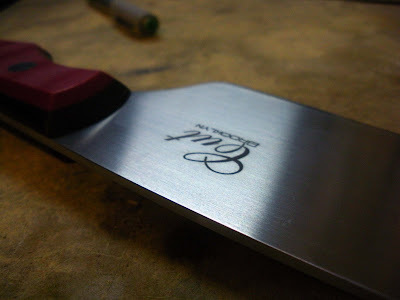 Each knife is a work of art unto itself - a step in a continuous design process of creating the ultimate knife. 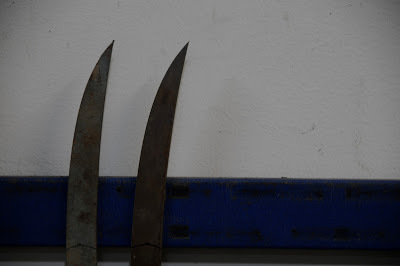 Bukiewicz is relentless in his study of shape and material (he's currently testing Carpenter CTS Alloy Steel the XHP vs the CPM154 to be exact) and his knowledge of the techniques and details of the trade are impressive..his knives boast 62 Rockwell (hardness of steel to keep a blade sharp, ladies and gents) in comparison to 55 Rockwell of most standard kitchen knives. Perhaps most importantly, he let us test drive his knives - and he sharpened our modest (and embarrassingly dull) knives - a true gentleman we have here. Sorry ladies, he's taken. And bad news for all of you looking to buy one of his masterpieces, get in line, he's got a year long waiting list. Bukiewicz in his own words after the break. How did you come to making knives? It turned out to be remarkably and surprisingly fulfilling from a creative standpoint, and I just fell flat out, stars in my eyes in love with it. I pushed myself hard, spending every night in the shop until 2 or 3am, 7 days a week, and it became apparent fairly quickly that I had a talent for it. Which I guess was lucky, because it would be a bummer to be terrible at something I love to do this much. 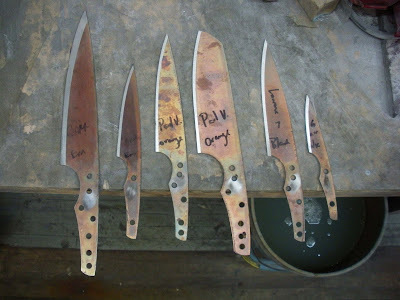 I began selling the knives I’d made just a few months after making my first, and after those first few checks rolled in I came up with the brilliant idea that I could make it a living. Did you have a knife-making mentor? No. I’m ashamed to say that I’ve still yet to set foot in another knifemaker’s shop. Early on I learned what I could from books and online resources, and then just spent countless hours in my little makeshift workshop screwing stuff up and trying not to get hurt. When you make a mistake that wrecks a piece you’ve already put 20 hours into, that’s a mistake you’re not going to make again. So I’d say learning was really a matter of getting my hands dirty and making lots of mistakes. And I’m still learning—there are always new processes to learn and play with, new and challenging materials to work with, new task-specific knives to try to get inside and build. I think my favorite part of the process is the final unveiling, when I finish hand working the handles and remove the masking tape that’s been protecting the blade, and all of a sudden a knife appears. You’ve been working so long and hard on these different elements of the knife, getting everything symmetrical and balanced and perfect, and the handle looks great but the whole package is still this ugly thing covered in blue tape. And then off comes the tape and you have this beautiful finished piece in your hands. If I’ve put all my knowledge and effort and skill into it, then what I’m holding at that moment is as perfect a knife as I have it in me to make. That’s a great feeling. 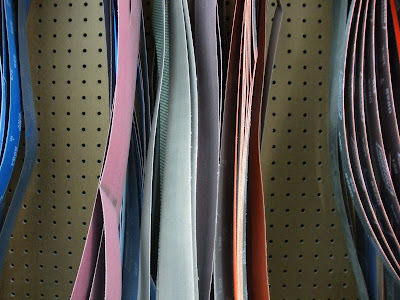 Are there any new materials or processes that you are testing that will improve the performance of your knives? There are indeed. I’ve been testing a bunch of new steel for the last 6 months or so, and it’s become more and more clearly apparent throughout the process that Carpenter’s new XHP steel is a head above anything else out there right now. It takes a beautiful grippy edge and it holds an extremely thin edge longer than any other material I’ve used. 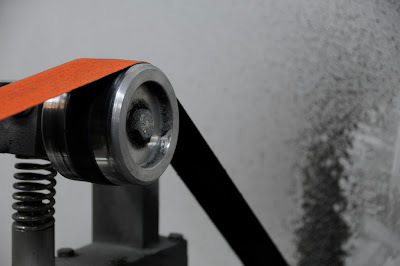 It’s also remarkably easy to sharpen, even at high hardnesses, and it’s super clean and highly stain resistant. As soon as I can get some from Carpenter’s mill I’ll be using it in everything I make, and, steel nerd that I am, I’m super, super excited about it. Are there any name-worthy chefs using CUT knives? Brad Farmerie of Public and Double Crown, as well as Iron Chef fame uses one of my knives. Here in Brooklyn David Shea at Applewood and Paul Vicino at Five Front use my knives, among others. I’ve been dying to make a knife for Kevin Gillespie, from last season’s Top Chef, since seeing him at work on the show, and I was finally put in touch with him a few weeks ago through a friend. So I’m really looking forward to building him a piece. Not everyone who contacts me for a knife presents their credentials, so I’m not sure what kitchens a lot of my knives are in, but I feel safe saying there are a good few out there helping to make some pretty awesome food. We hear you want to make Brooklyn the Knife epicenter, how's that going? 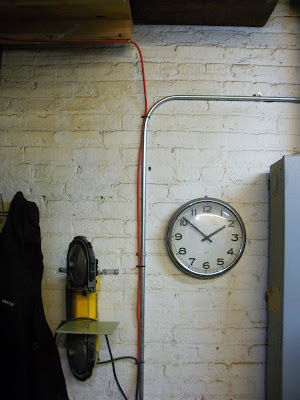 Are there any other knife-makers working in the Gowanus? I think I know the comment to which you’re referring. I think what I said was that I’d love it if Brooklyn became known (again) as a place where great knives are made. At the moment there are a couple other makers here in town, but no one else who focuses on kitchen knives. It’s an endeavor that tends to require a bit of space—you can’t grind knives in your apartment if you don’t want to wreck your lungs—so I think Brooklyn is probably a pretty tough place to learn to make knives. But if there are any other budding knifemakers out there in the city I’d most definitely encourage them to give me a shout so we can get together and talk shop. Carroll Gardens is a bit of a foodie haven, that said, what is your favorite restaurant in your neighborhood? I live in Windsor Terrace and my favorite place is The Farm on Adderley, just down the way in Ditmas Park. Chef Tom Kearney is doing awesome stuff down there with seasonal, regionally sourced ingredients and some really exciting and innovative flavor combinations. Every plate on their menu is polished and considered, and surprising in at least one way. What is your all-time most memorable meal, and why? My most memorable meal has to be an orange glazed leg of lamb I had in Amsterdam in December of ‘99. I’d flown in that afternoon from a 3 month backpacking trip in Kenya where I’d spent just about every night in a tent and had prepared all my meals on a campstove. After a crazy long hot shower and a walk through the snow along the canal that lamb was unimaginably delicious. 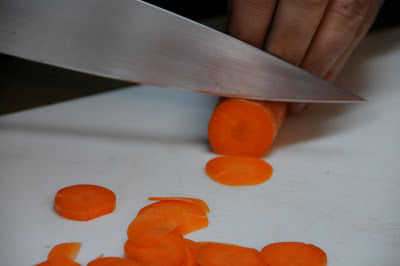 What is your favorite thing to cut, and with which knife (I would imagine there is a deep satisfaction in this)? I do most of my work in the kitchen with my 9” chef’s knife, and that’s the piece I enjoy using most. I don’t really have a favorite food to cut—as long as there’s lots of stuff to chop up for a recipe, I’m happy. Putting together a good hearty vegetable soup with all kinds of different fun ingredients is a lot of fun, as are recipes that require a bit more technique. Do you cook too? If so, signature dish that always impresses a special lady, that is. I do indeed cook. Aside from making knives I’d say it’s my favorite way to spend time. If I want to impress I tend to try something new. You’d think sticking with a standard would be the way to go, but I know when I’m putting together something new and exciting there’ll be that little extra passion in the dish, and I always enjoy taking an opportunity to try something new. Making knives is a very dangerous trade, one would imagine. Have you had any close calls? 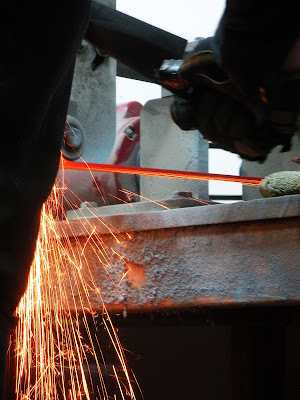 I make a point of maintaining a great deal of respect and a certain amount of fear for my machines and knives, so (knock on wood) beyond the daily burns and scrapes and cuts, I’ve managed to avoid too many close calls with real injury. A few years ago I was in the shop at like 4am, muscling through a small batch of knives for the annual Unfancy Food Show up in north Brooklyn, when I did have a bit of a scary moment. I’d been in the shop since like 8am the morning before and was super tired, and I let my attention wander while prepping a big 10” chef’s knife that had been ground and sharpened and was waiting for handles. I was moving the knife from one spot on the bench to another when I felt the tip just brush up a little against my forearm. There was no obvious cut, so I set the knife down and held up my arm to give it a look when out shot this thick rope of blood. I watched it arc out from me and land about 5 feet down the bench, then out came another that went about half as far, and another, until it just pulsed from a little mouth on my forearm about the size of a pencil eraser. In my giddy exhaustion I was amazed that my body had just put on such a show, and was thinking how cool it was as I searched out something with which to apply pressure. I got some gauze on it and good pressure but the sucker wouldn't stop bleeding and as I thought about where my cell phone was I had a moment where I got a pretty scared about being the caliber of idiot who would bleed out in his own shop while searching for his phone to call for help. But I did get my phone in hand and pretty soon the bleeding let up, so I was lucky not to have fully severed whatever it was I hit. I packed on some cotton balls, bound the whole thing up good and tight with duct tape and managed to get that knife and a few others finished up for the show the following day. What foods turn you on? Well chosen, ice cold, freshly shucked oysters. A perfectly cooked piece of meat. Apples off the tree in October. I tend not to be terribly adventurous when it comes to cocktails. Whatever looks good from the bourbon list with like two little pieces of ice for me. cut bk from ariadne ax on Vimeo. We thank you kindly Mr. Bukiewicz, you are a true gentleman, and the first chance we have to get you into one of our favorite bars, the bourbon is on us. These are so beautiful. His work is incredible.